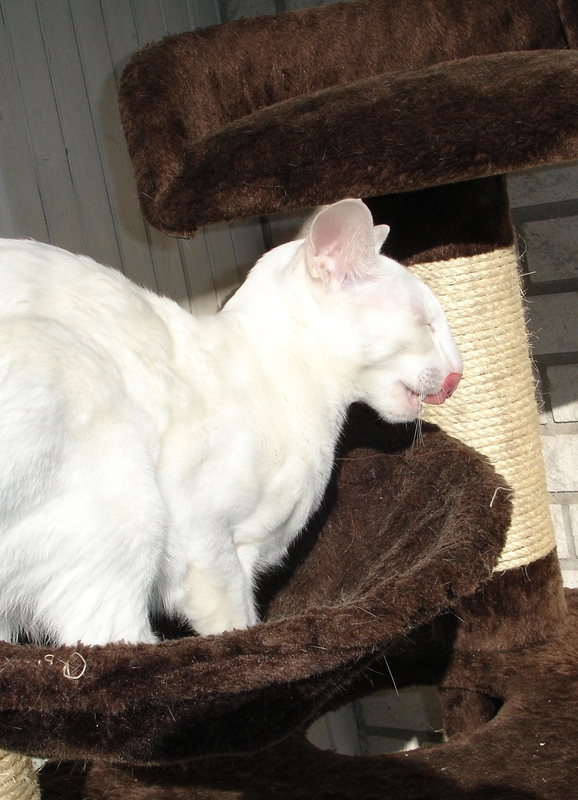 The veterinary called me this morning, and – they still do not know what the x-ray show. The radiologist could not exclude metastases on the lungs, but could not tell that they are that for sure either, so we will go to CT, computed tomography exam. They should call me from the animal clinic tomorrow to book a time for that hopefully on Monday. If Jossan has metastases, we will not operate. If she does not, we will. That sounds so simple. It is really a simple decision to make when we know the answers, but it is not easy. It is hard on our hearts. 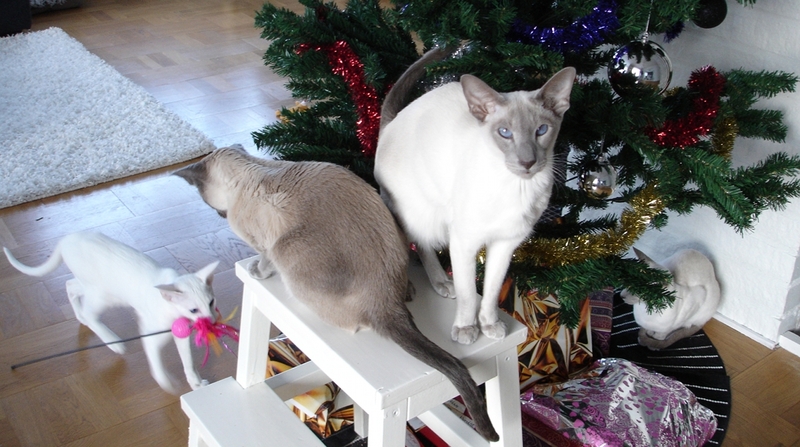 I was sad lately, and, although I think that our cats are very affectionate every day, I noticed a change in intensity, especially with Albert and Jossan. Jossan is following me as a post stamp follows a letter, from the moment I come home from work to the next morning when I depart to work again. She even talks to me in new ways. Albert comes and takes care of my hair and has cuddling sessions more often than usual. All of our cats are loving and I love them all the same, but Jossan and Albert are a bit special in a way, they don’t care about other humans as much as they care about me. 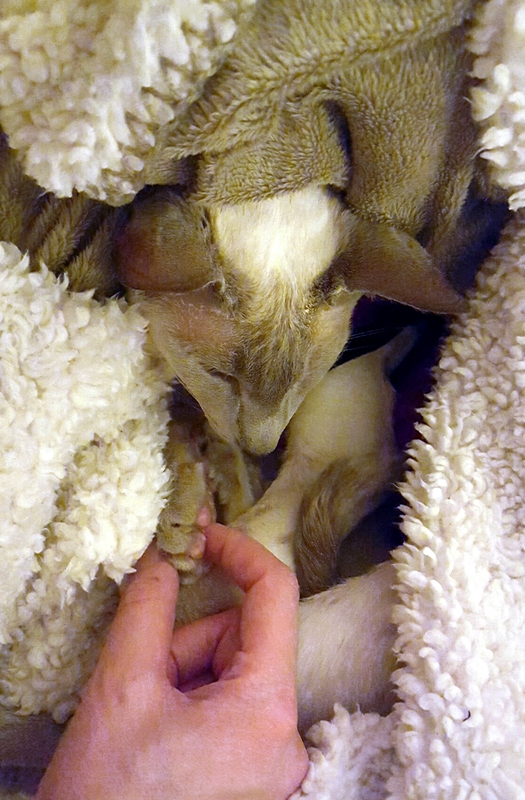 When Jossan sits in my lap while I write mails or make jewelry, I feel happy and content. I thought about that recently at one point when I became aware of the whole situation and how good I felt, with my little loving cat in my lap – that was happiness in one of its forms, right there, right then. 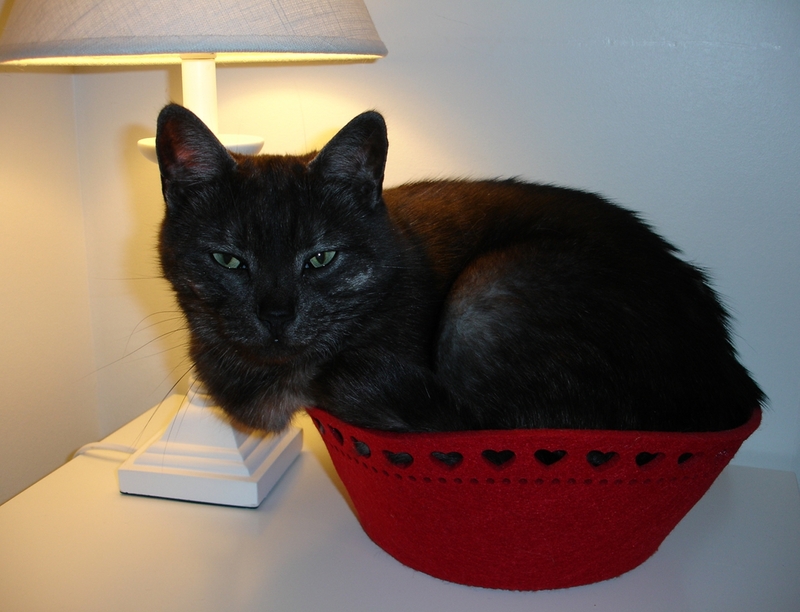 Jocke got his working corner in our living room recently, where he, in his turn, set up a cuddling corner for our cats. 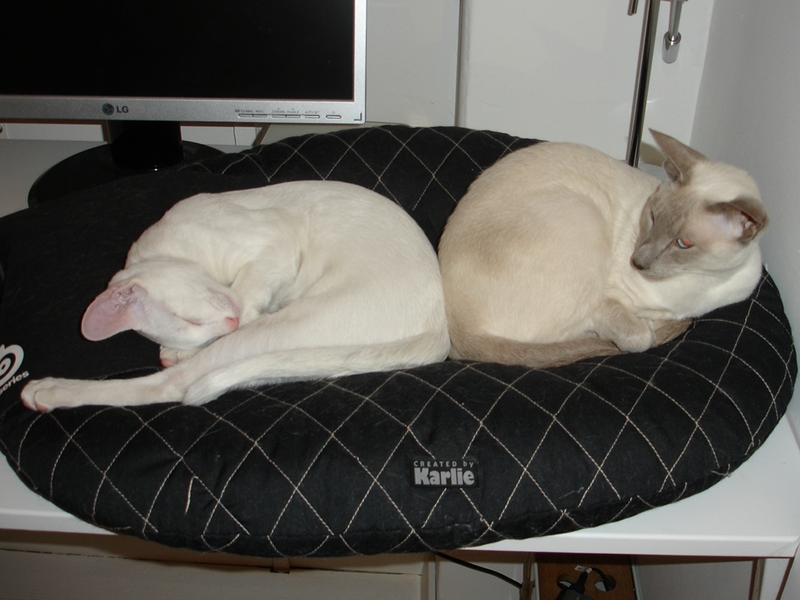 It is mostly Maven and Leroy that sit there while Jocke works on his hobby projects. 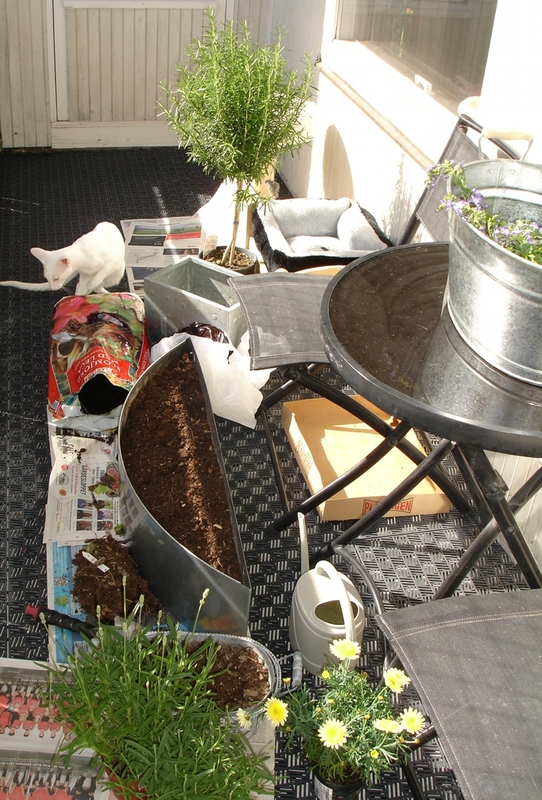 Today we had one sunny day after a lot of rain and cold last week, so we tried to arrange the balcony a bit. 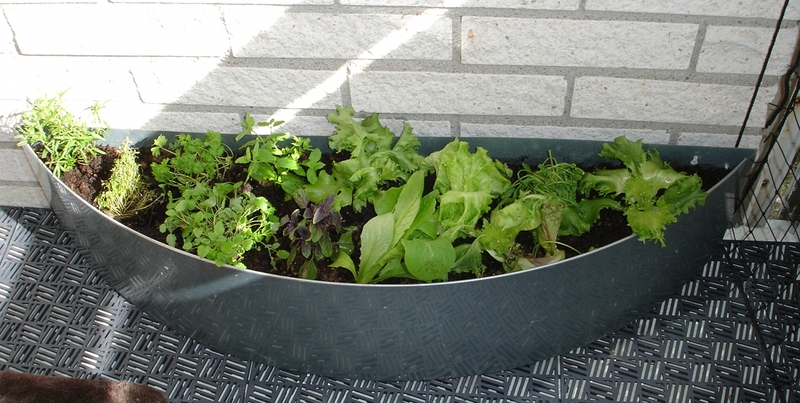 We want to grow plants that cats like to eat (like lettuce and Roman salad), also, herbs that we use in cooking and flowers that are not poisonous to cats. It is a whole summer project, I guess, but the first plants (if I do not count pelargoniums that hang outside of the net, towards the street) have moved to the balcony today. 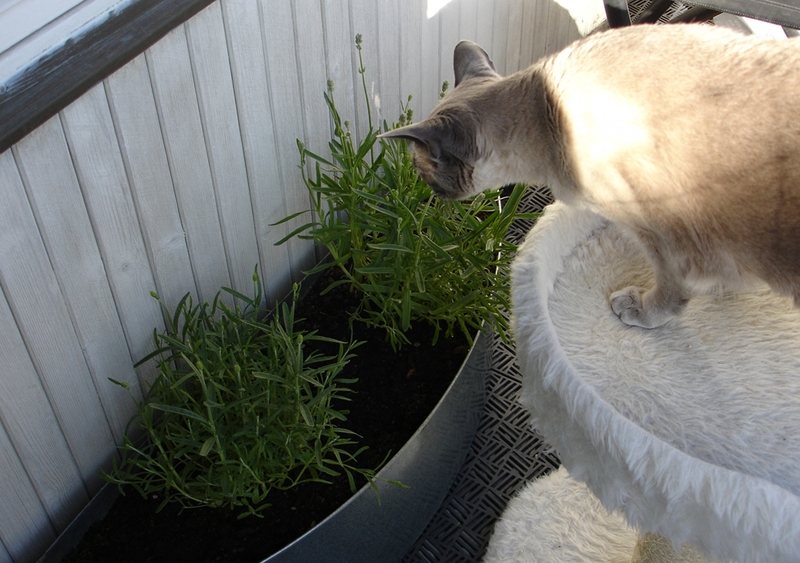 The cats smelled the plants carefully (that is, all cats except Albert; Albert chewed on everything but rosemary). Jossan chewed on some salad as well. 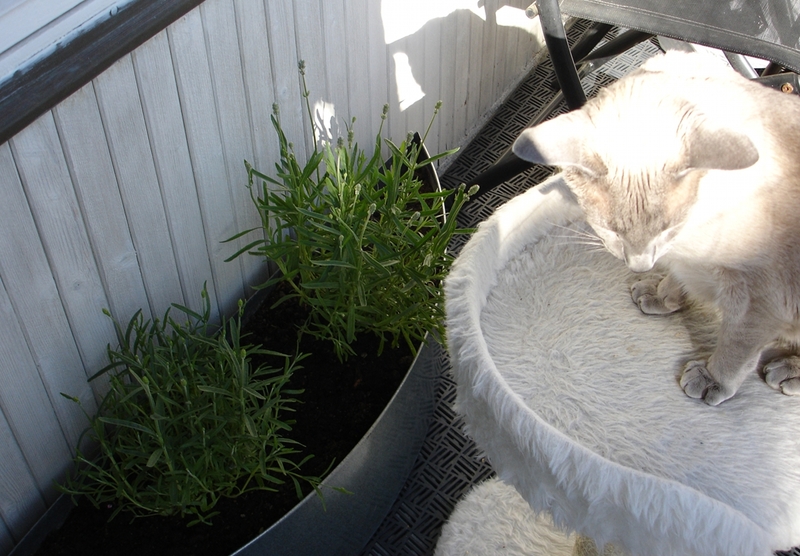 The cats seem to appreciate our efforts (or, at least, they do not complain, and they showed a lot of interest in gardening). 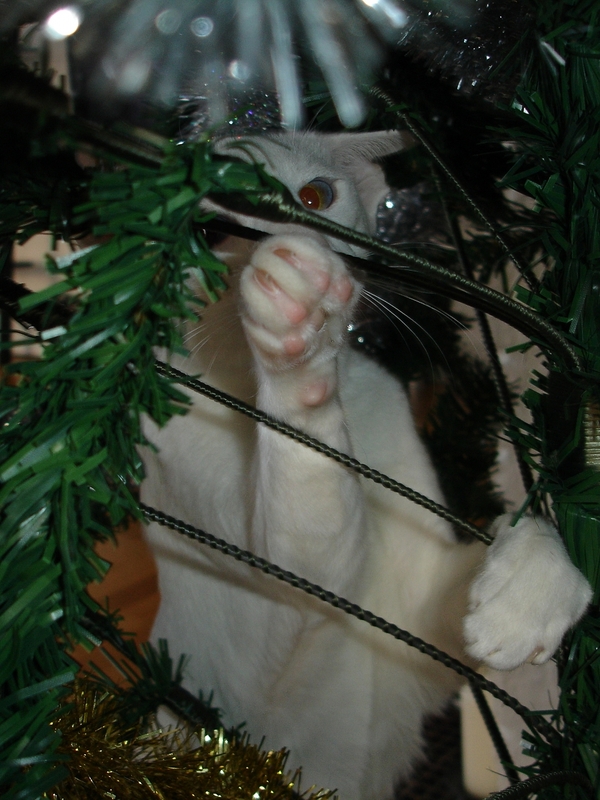 Less than a month is left to Christmas! 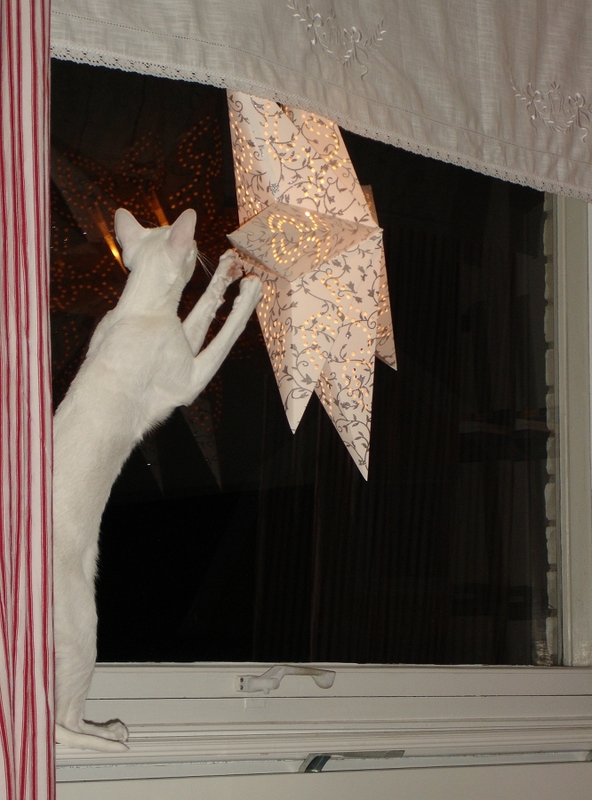 We started putting the decorations; so far the new curtains are up and yesterday we put the stars in the windows. A black smoke bun, someone? I have no clue how Maven manages to fit in such small boxes and baskets! My humans have no sense of composition! 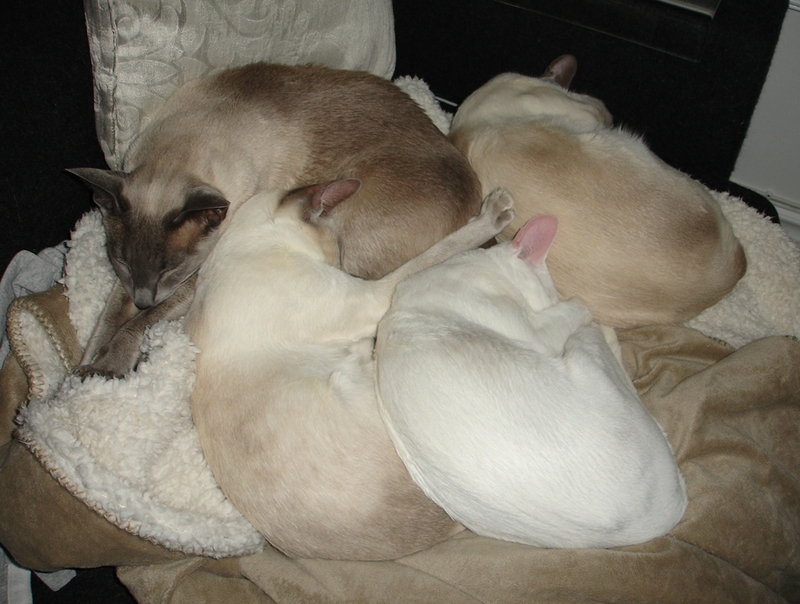 Our cats adore the blankets we use during the winter; they are soft and cosy. It is very warm in Stockholm during daytime. Jocke put together a new desk for my hobby room. Cats got so tired from watching all the work. 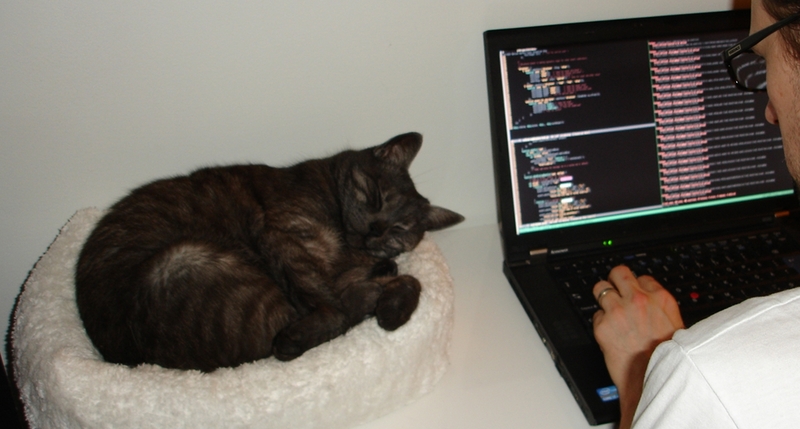 Cats love work. It fascinates them. "Nothing would ever get done if it weren't for us!" 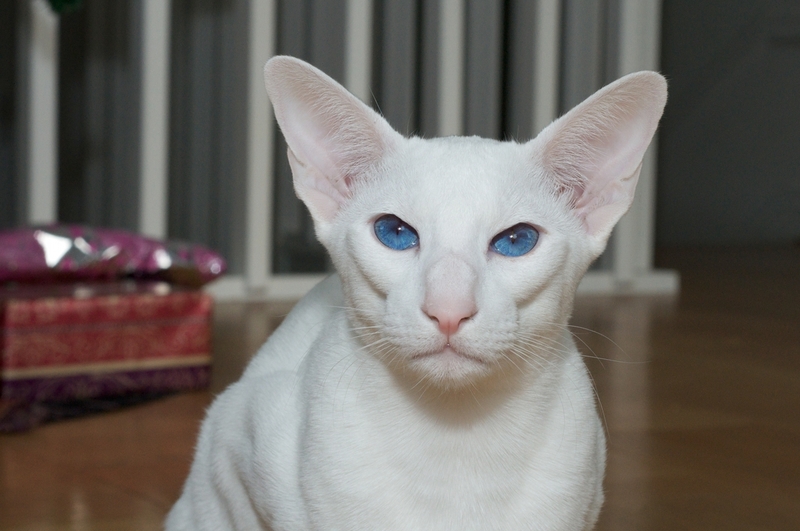 There is a reason that our cattery name is La Voix. 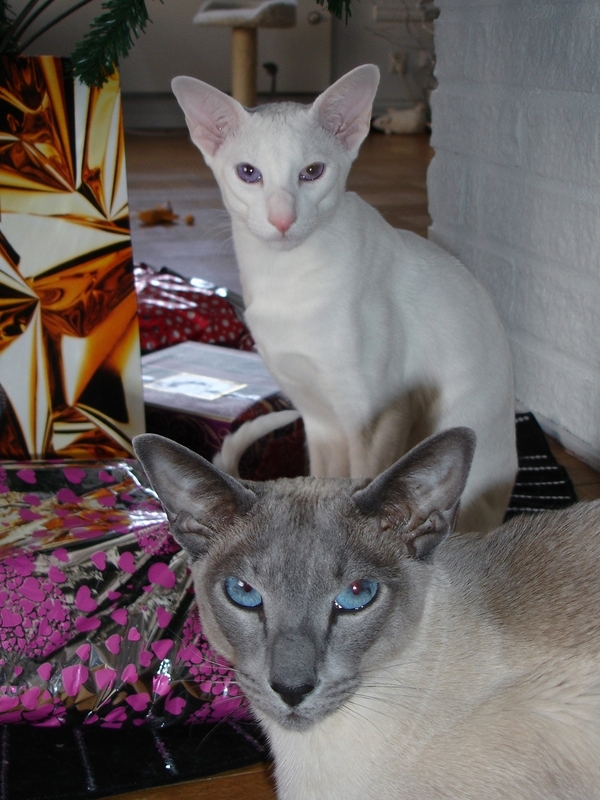 Siamese in general are more talkative than other cats, and our Siamese are very vocal when they want something. Leroy especially has a very strong voice that almost all of his and Jossan’s offspring got. It is not like our cats are yelling or being loud often. But they do express their opinions loud and clear! Albert loves to be close to the kittens. They are very small and have one room where they can be left alone with their mom. Other cats can come and join them when we are there, and they like to sit and watch the small ones. When we get up in the mornings, this is where Albert is, telling us that he wants to go in and see his siblings!!! And today he sat in there for a long time, watching his mom and the small wonders and then, very carefully and gently, he sat in with them in the tipi! He was there for a few minutes, then I took him out so that Jossan could stretch a bit. He was melting with love, he adores them! Mom, I'm your baby, too! 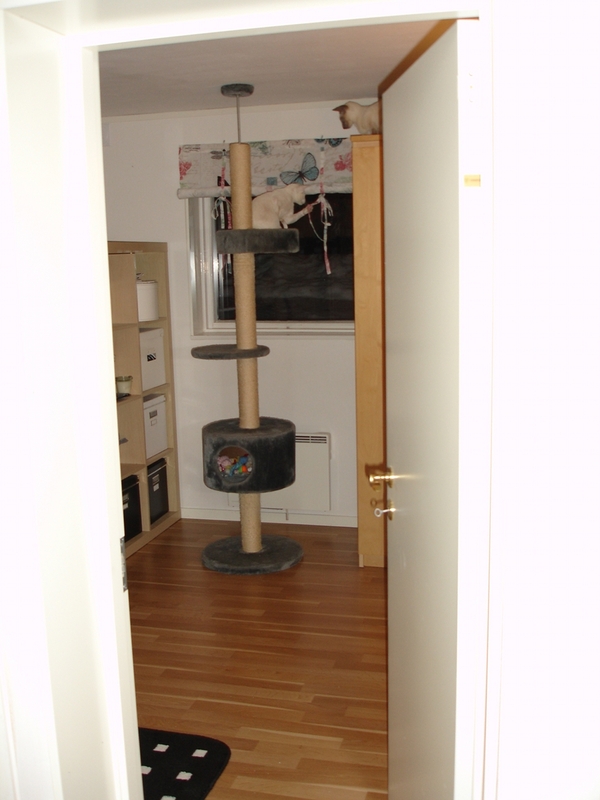 We also have a big kitten house that we got from Germany, but it is too soon for them to move in there. They have to be better at crawling first. They must be close to their mom where it is warm, and she prefers small spaces with roof, she feels that they are warm and safe there. 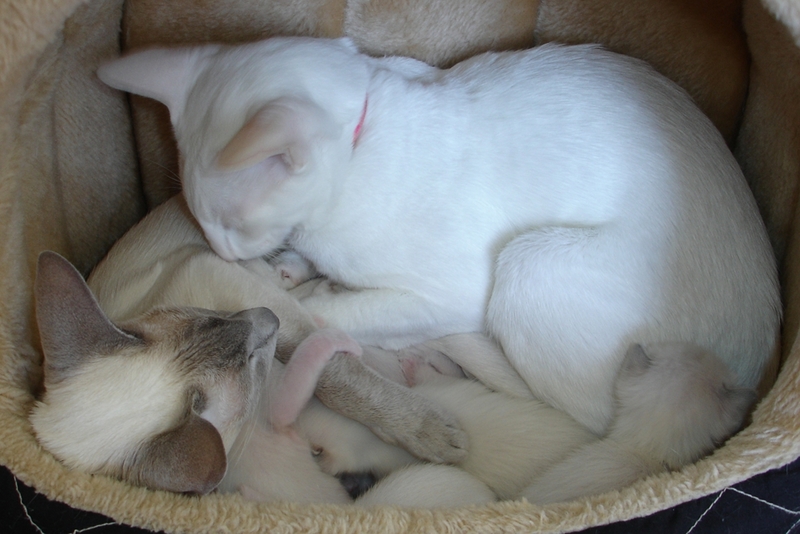 I’ve learnt a lot from my cat about what is good for kittens. 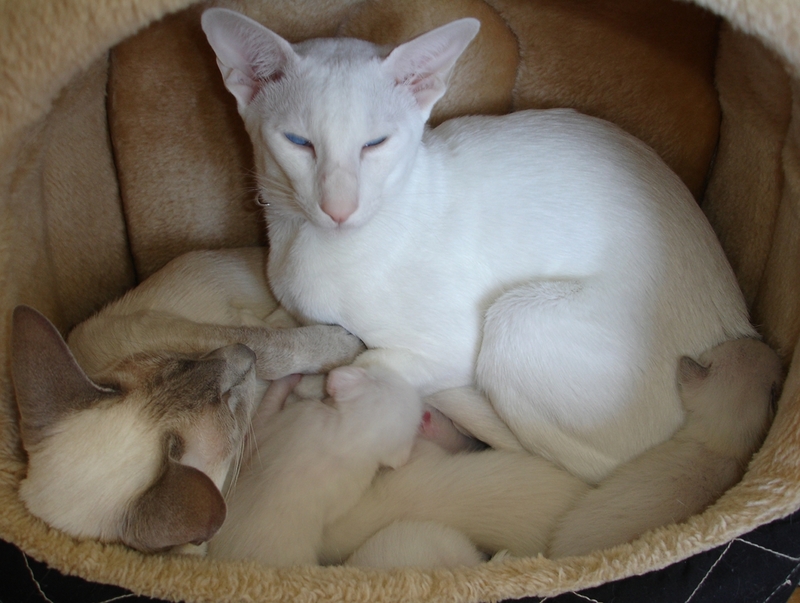 We are very happy with Albert’s temper and I hope that his future kittens will get it from him. 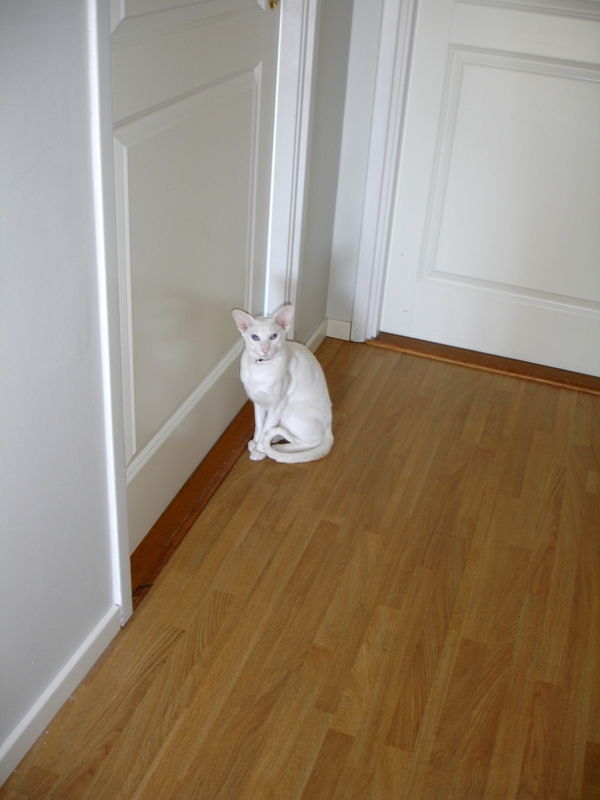 He is almost one year old, fertile and very capable as a tomcat, but he is not spraying at all and he is seldom restless. He is very cuddly with us, especially with me. He can be upset and yell sometimes, but that is when we do something wrong. Our cats love to participate in everything we do. We lived in an apartment earlier, which we arranged in a bit sterile, modern style, but this house requires different style and it takes some time to live in it and feel what suites the interior. It is fun to arrange things, and all the help makes it so much easier… hm. Or, does it? 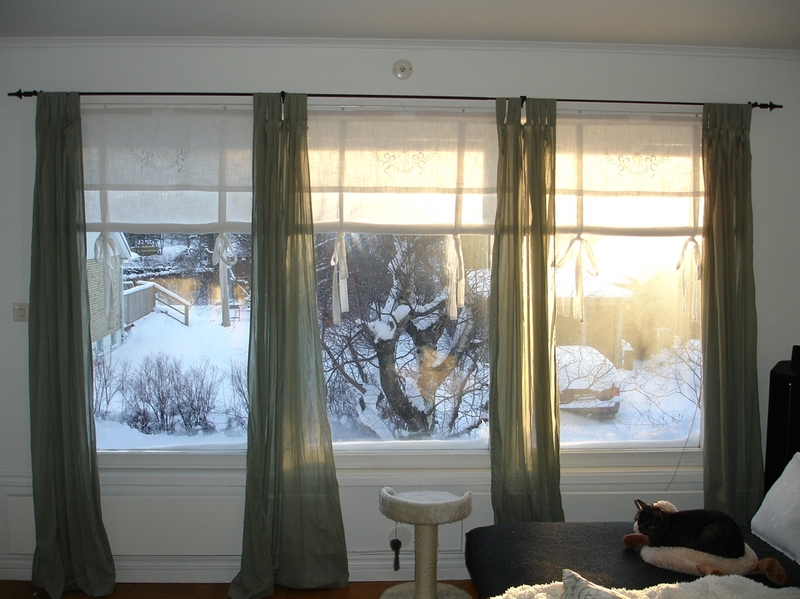 Well, this is how that window turned out, not so bad we think. We are arranging one of the rooms as ‘the kitty room’, where we keep their furniture, clean towels, beds, some of our books etc. In the future this is where we will have the kittens when they are small. Right now the litter boxes are also there, but we will place them in the cellar later. We kept the wallpaper on one wall (put by the previous house owners). This was one of their children rooms, and there are butterflies on the wallpaper. We thought it looks cute in the kitty room. We also bought a curtain with butterflies as well and yesterday we put that up. Ribbons were highly appreciated! 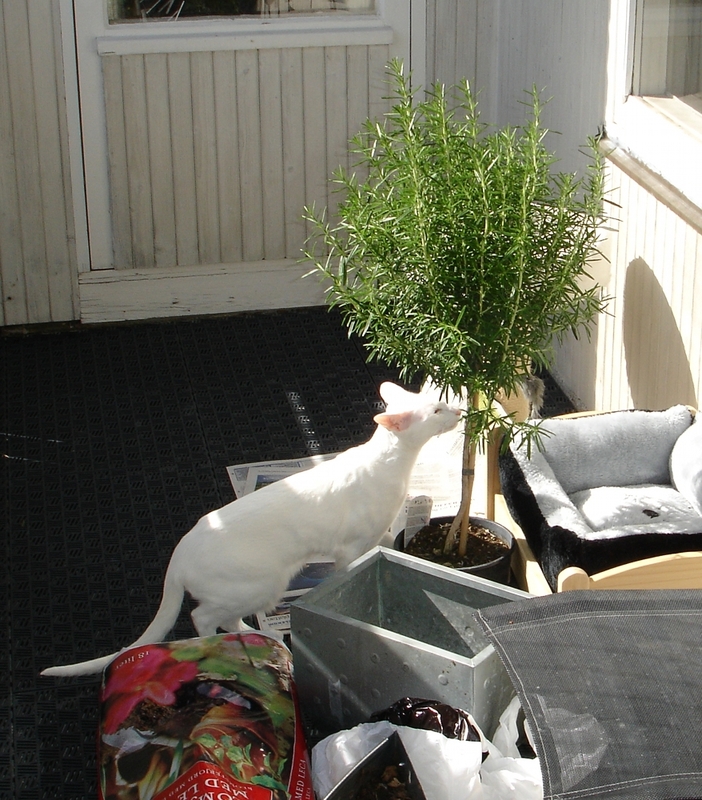 (För er som bor i Sverige – vi köpte gardinen här: hissgardin Audrey . Jag tror att det finns tyg och gardinlängder med samma mönster). Albert and his siblings turned 8 months yesterday. They all are big and healthy and loved. 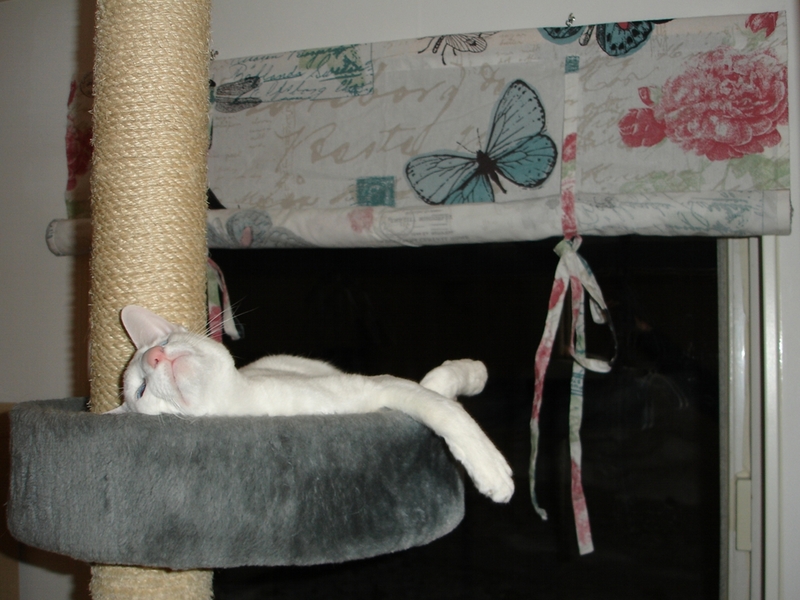 Here is Albert, enjoying the new curtain! The moving company truck is coming in 8 hours. We still have so much to pack and also, we have to disassemble some pretty big pieces of furniture. We have 2 more weeks to move, but then we have to do it ourselves, by car. 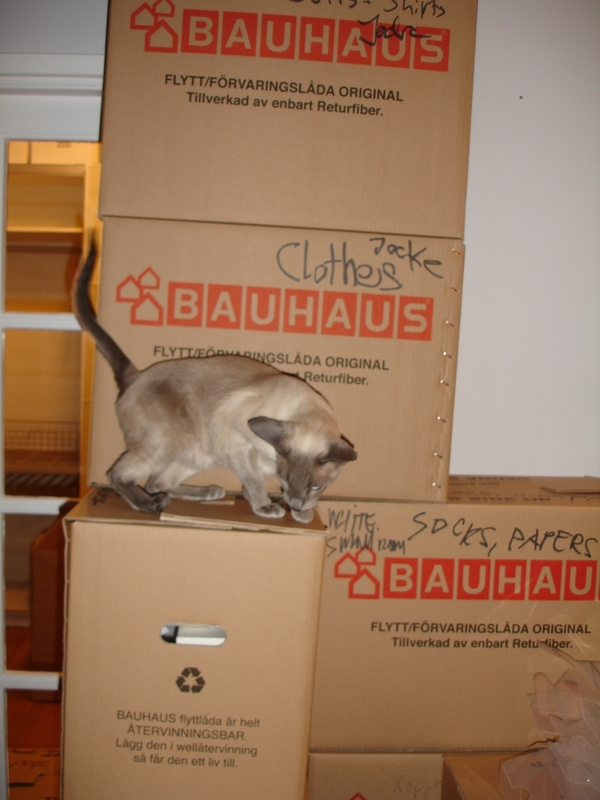 We are trying to pack as much as we can now. 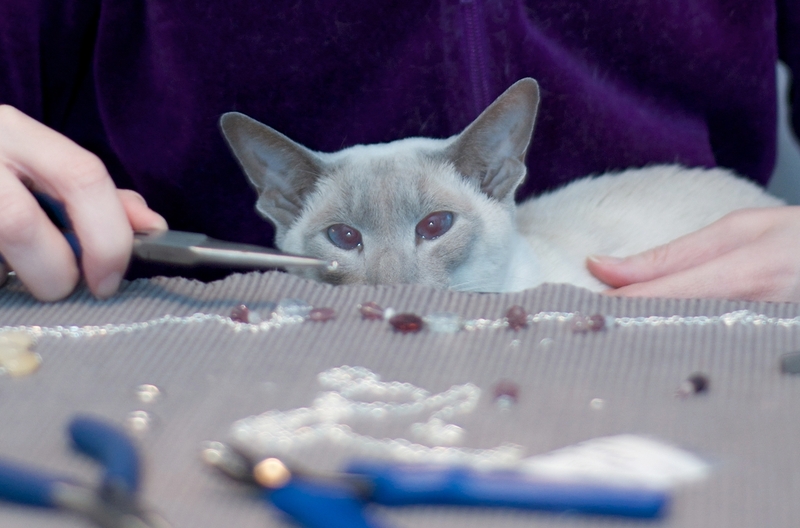 The cats are helping, of course! Miii is checking if everything is closed properly. 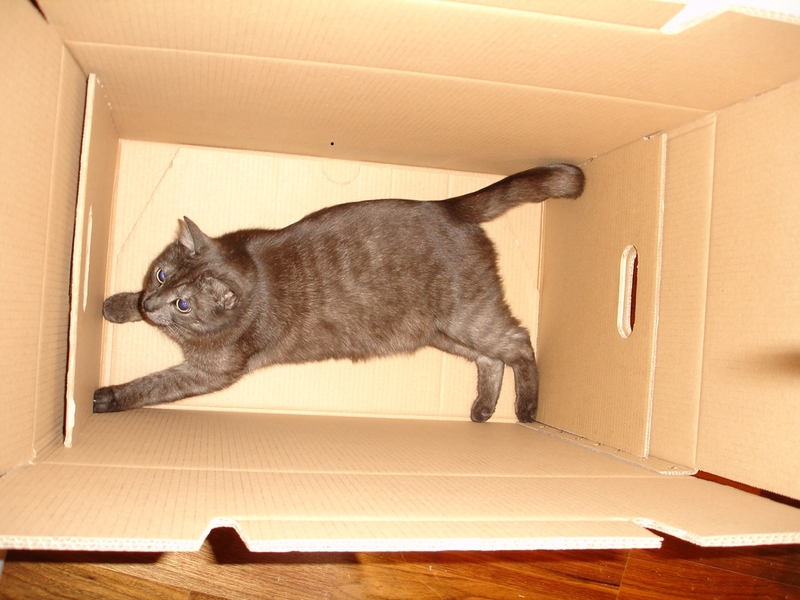 After every box we pack we have to make sure that no cat somehow jumped in and tried to hide. 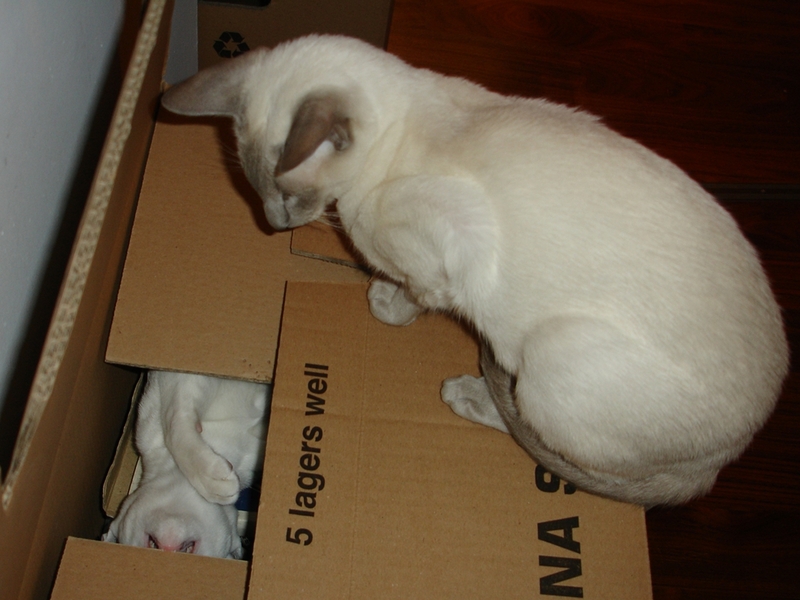 Cats like boxes. Albert is smaller and a bit hard to notice. 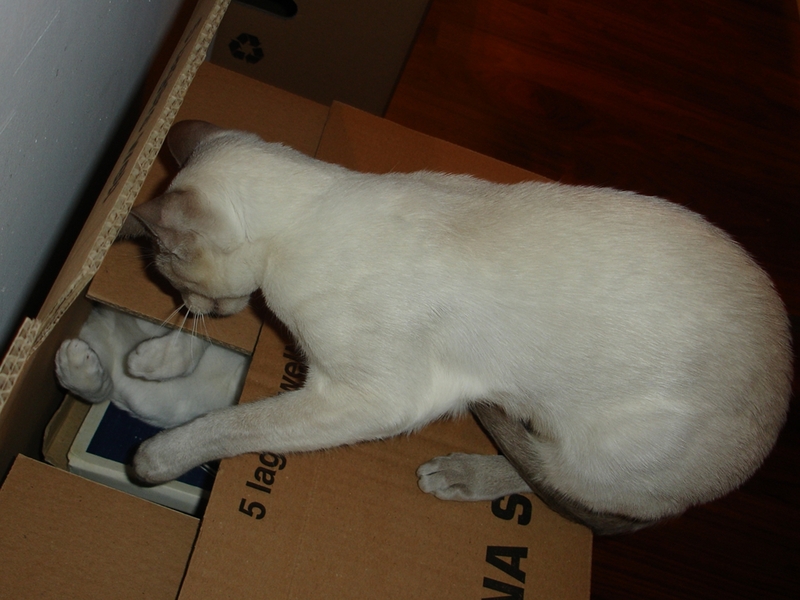 Here, we documented how at one occasion Jossan helped us find him and, also, tried to pull him out of the box he managed to break into! 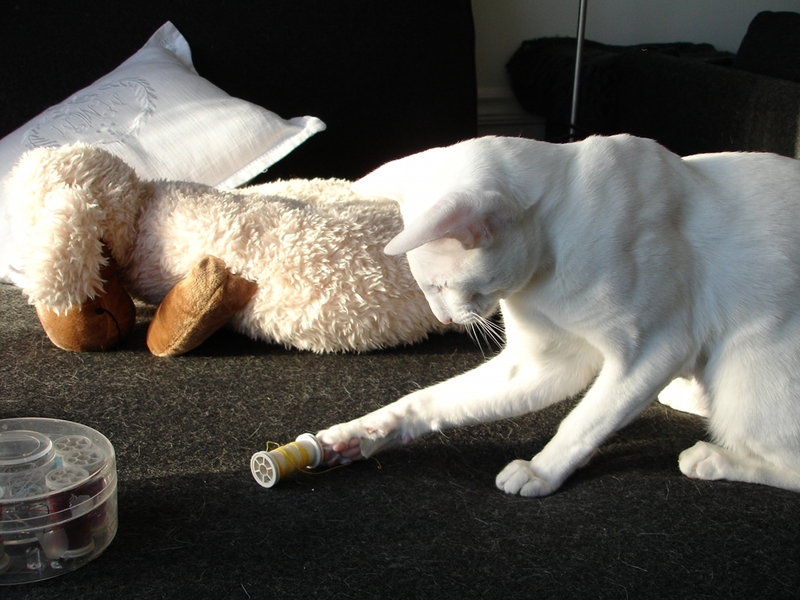 And then I took Albert out of the box which we closed again and put under another box that he cannot break into (or so we believe…). 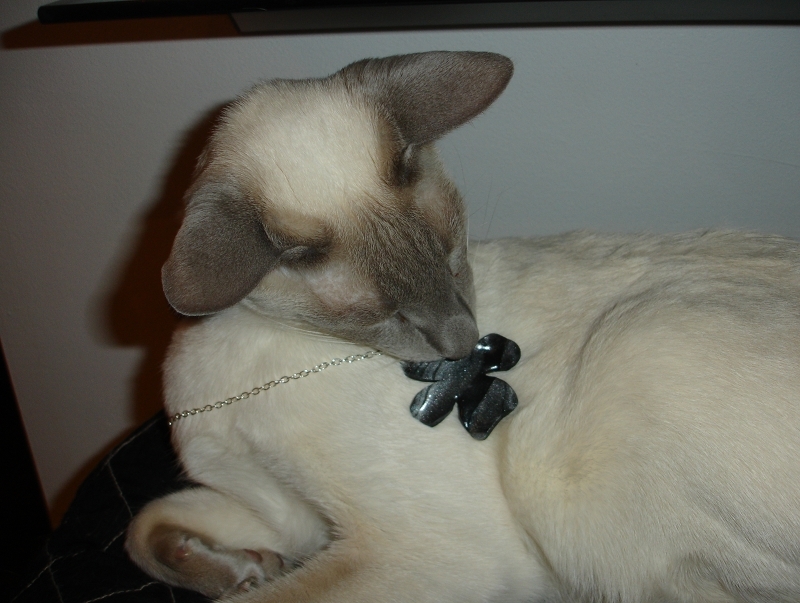 Leroy is testing a necklace Jelena made. Last Friday we got a surprise package from Danijela! Oooh, how happy we got when we discovered tons and tons of some of Jelena’s favorite candy in the bag! 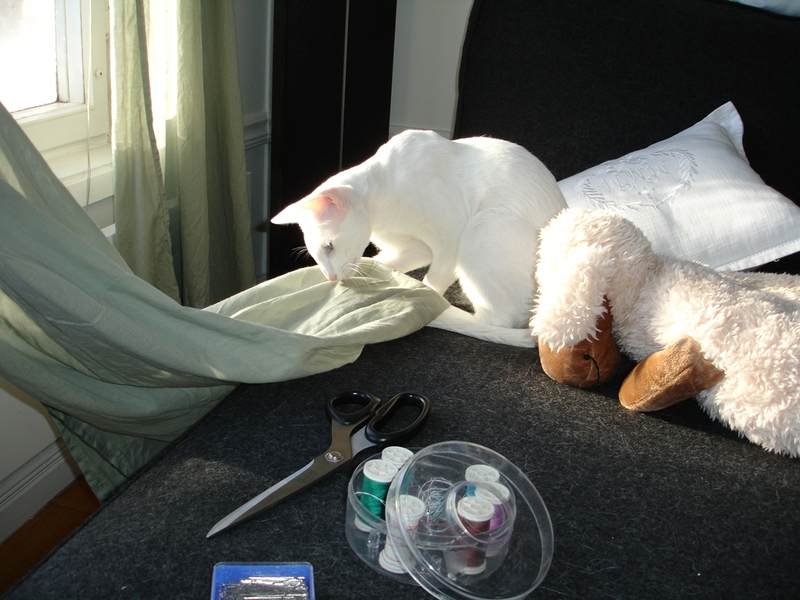 The cats were helping tremendously. They love to organize stuff, though we often have different opinions on what “to organize” means.